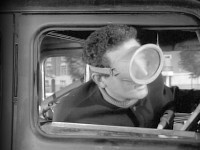 Steed and Emma are crammed into a three-wheeled bubble car, and they overtake Georgie driving a Steed-like Bentley. Returning from vacation, Steed is faced with some puzzles, such as why a pretty, plucky young woman named Georgie Price-Jones is impersonating Emma, and why everyone Georgie ever met is being murdered with knitting needles. The trail leads to an art dealer who is auctioning off Emma for her secrets. Although it has a tendency to be too cute at times, there are some wonderful bits, such as Steed calling the fake Emma on the phone ("It's ol' loverboy himself! "), Steed hamming it up as art-dealer Wayne Pennyfeather ffitch ("My nerve ends are positively tingly! "), and the taxi driver amusing himself while hauling Steed and his junk around forever. Acronym Alert: AKC is the Arkwright Knitting Circle. Steed's Aunties: After clobbering Steed with a vase, Georgie says, "I thought you were an old lady with a bale of knitting needles." 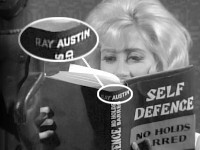 Steed replies, "They do say I take after Granny." This, by the way, is the episode that inspired me to add the "body count" (the headstones under "Stats") for the Emma Peel episodes. And speaking of stats, Mike Kunkel has earned bonus points for noticing that Steed carries a gun in the pocket of his trousers; after knocking down Ivanoff, he hands it to Georgie. Dyrham Park Golf Club, Dancer's Hill, served as the setting for the charity ball. Look familiar? Perhaps you saw it in "The Thirteenth Hole." Steed: "Six bodies in an hour and twenty minutes. What do you call that?" Georgie: "It's a good first act."